This evocative Lakeside Vineyard tapestry shows a stunning view of the vineyards in Tuscany. The gorgeous scene is from a terrace of a 16th Century Palazzo in Tuscany, and the attention to detail is superb. We can see the intricacies of the crops from near to the distance, and the palatial terrace with its columns and arches provides a foreground to ground the scene as well as to draw our minds and senses into the scene. The viewer is transported into the Tuscan countryside of immense beauty as the imagination is playing in the beautiful colors of the scene including the dreamy rendition of the distant lake and mountains. 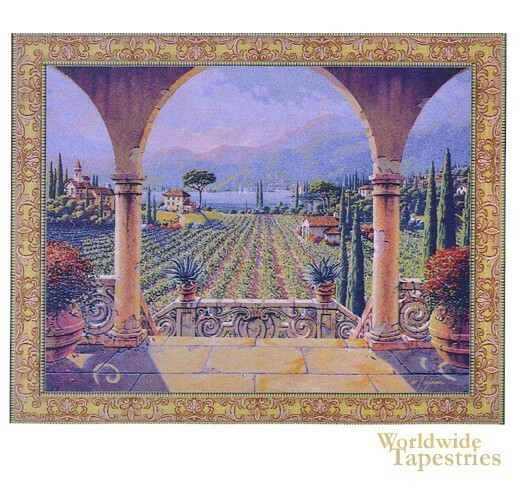 This Tuscan landscape tapestry “Lakeside Vineyard” comes complete with lining and has a tunnel for easy hanging. Note: Tapestry rod, where pictured, is not included in the price. Dimensions: W 63" x H 52"
Dimensions: W 82" x H 64"